Computers and networks are now an integral part of most small businesses and it is vital that they work reliably. By joining the Plus Monthly Maintenance Plan we will provide regular system maintenance that will help you to avoid many IT problems before they occur. In a busy office environment routine IT tasks may have taken a lower priority to core business issues, and the maintenance plan handles those for you boosting both reliability and providing peace of mind. We can provide support and services on demand for your existing IT systems as well as help define system enhancements. Depending upon your network setup many of these tasks can be run remotely and/or out of business hours to provide the minimum disruption in your office. While the Plus Monthly Maintenance Plan is the best possible way to protect your company from major downtime. Everything possible will be done to ensure your computers and server run to the best of their ability; Dougwoody will not be held responsible for any mechanical failures or results of mechanical failures. As with all electrical equipment, parts may fail at anytime. All parts are additional and will be charged separately. 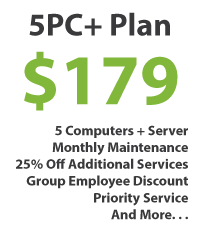 5 Computers/Workstations +Plus 1 Server are included with this plan (add up to 4 more at $25 each). Any additional work, not listed in this agreement will be billed separately at 25% off the current rate. Trip charge is half price at $50.00 – A trip charge is applied if work is not done remotely. All fees are due upon receipt of invoice. Invoices are emailed or delivered at time of service. Cash, Checks and Credit/Debit Cards are accepted for your convenience.